Unbelievably Wellington on a Plate is drawing to a close for another year - though I'm sad it's almost finished my body is slightly relieved, as my food consumption has been a bit excessive over the last couple of weeks and I have that permanent sort of food baby feeling going on. However, it's not over till it's over, and the grand finale is the Malaysia Kitchen Night Market tomorrow. Today I was fortunate enough to have lunch at Kayu Manis with a munch (that's the collective noun for a group of food bloggers, as defined by Jo from Wellingtonista) of lovely ladies and the great Chef Wan, to prepare my tastebuds for tomorrow and to further enhance my food baby. Having Chef Wan at the table was not only highly entertaining (he talks a mile a minute) but very informative - he really is an ambassador for Malaysian food, and as we ate he told us about ingredients and variations on each of the dishes we were trying. If you're dining at Kayu Manis and get to sit downstairs you can watch the roti being made. When the chef started on this our food-obsessed table all got up and swarmed around to watch - it's an impressive process, with a great deal of skill (sadly the really impressive bits are performed too quickly for me to capture without huge amounts of blurring, so you'll have to go see for yourself), and the resulting roti are amazingly fluffy and very authentic according to Chef Wan (who would know!). Once we were done snapping pictures of each other we returned to the table for the main part of our meal. The mains were all so very, very good - the fish sambal was full of huge pieces of crunchy fried fish and the sambal sauce was lovely, and the rendang (which I've had before) has a lovely rich flavour, though is a little dry for my liking. The star for me was the lamb kuzi - it's the unpretty dish in the middle above, but it well and truly made up for its looks with flavour. The sauce for this dish is made with raisins and milk or yoghurt, and the sauce was creamy and rich, with incredibly tender lamb - just fantastic! 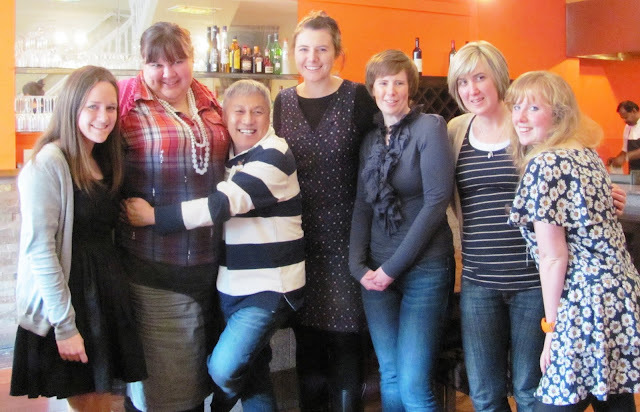 In case you're wondering what a "munch" looks like, this is us, with Chef Wan hamming it up in our midst - such a friendly soul! Chef Wan will be demonstrating at the night market tomorrow, and there'll be various stalls with food available for purchase. It's in Opera House Lane, so hopefully will be nicely sheltered from any crazy weather conditions Wellington chooses to throw at us, and sounds like a great afternoon/evening out - hopefully I might see you there! What Wellington on a Plate events/restaurants have you been to? Are you using tomorrow as a final opportunity to squeeze some eating in? The Malaysia Kitchen Night Market is tomorrow, Sunday 21st August, 4pm-7pm in Opera House Lane, Wellington. The event is free and food is available from $5. Mrs Cake dined at Kayu Manis as a guest of the Malaysia Kitchen programme. Nice write up Rosa - I also have a permanent food baby and that lamb was incredible, though very unpretty! Yum, this looks amazing! the mussels look great, are they in a curry sauce? Yay, I never got a group photo on my camera. Am re-living that lunch, I don't think it'll be long before I return to Kayu Manis for more deliciousness. Laura, I know, the memory of that food will draw me back there very shortly! Millie, I am wishing my food baby away but think it might take a while. Still, worth it!